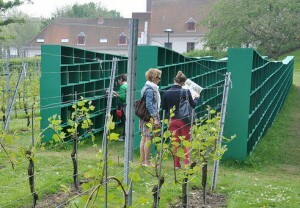 Artist Massimo Bartolini has elevated reading to an art form with his new green outdoor library at the Track Festival in the Belgium town of Ghent. The festival this year includes the works of 41 international artists and works exhibited as part of it can be seen all over town. Cycling and walking tours with guides are available and a booklet is available listing activities and things to find. Bartolini’s piece, titled Bookyard, is located at the garden of St. Peter’s Abbey and consists of 12 long, green bookshelves with cubbys containing books of all shapes, sizes, etc. Visitors are invited to take away a book for a small donation. So not only can they enjoy the spectacle of his outdoor library and its idyllic setting, but they can also benefit by finding a new book to while away time with during the long, hot summer. It’s a brilliant concept combining both art, reading, and the joy of books.